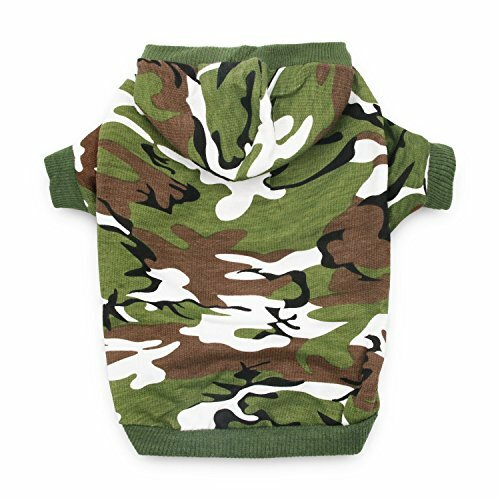 Product Highlights: Let your dog blend in with his outdoor surroundings, and look good doing it, with this Army Green Camo Hoodie. This great-looking hoodie puts on and off easily, and offers warmth and comfort at the same time. Everyone looks cool in camo, so let your dog join the club. Suggestions: a. Measuring your dog for a perfect fit. Sizing should allow room for 2 fingers to fit between the item and the pet. b. If any of the measurements are 'between' two sizes, choose the larger size. c. Your baby usually wears size S doesn't mean all size S will fit him/her. Care Instructions: Hand wash in cold water/Machine wash, gentle cycle. Line dry. Do not bleach. If you have any questions about this product by DroolingDog, contact us by completing and submitting the form below. If you are looking for a specif part number, please include it with your message.